Preservings photo.]] Peter A. Braun: business entrepreneur, born 16 April 1890 in Gnadenfeld, Manitoba, Canada to immigrant parents Johann F. Braun (1857-1925) and Helena S. (Abrams) Braun (1861-1919). He was the sixth of 11 children. 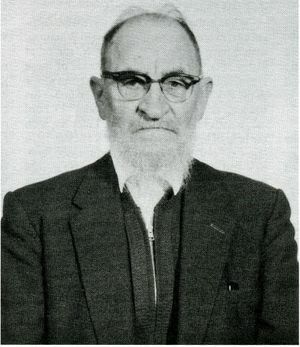 After completing most of his early education in Gnadenfeld and Grünthal, he was a teacher for a short time and then briefly attended a public school in Winnipeg. In 1910 he and his friend Peter Trylinski, whom he had met while working at the Grunthal post office, went to Alberta to help farmers during the harvest season. Here he met and married Minnie "Lena" Friesen (1893-1991), the daughter of Abram and Cornelia Friesen, in Sunnyslope, Alberta on 19 December 1911. He tried homesteading in Montana, USA in 1914 and in the Peace River area of Alberta, Canada in 1918, but neither of these ventures succeeded. The family moved to Grunthal, Manitoba in 1919 so that Peter could be closer to his ailing parents. Peter A. Braun bought land near the short-lived village of Friedrichsthal and a house in Grunthal, later moving the house close to his grandparents’ home before relocating to Hochstadt in July 1922. In 1923 he began a trucking company to transport cream and other dairy products from the farms to Winnipeg. Around this time, Braun began to manage the International Harvester agency, selling machines to farmers. In 1926 he became an agent for the Intercontinental Trust Company, helping new Mennonite immigrants from Russia acquire farmland vacated by families moving to Paraguay. A store and a cheese-making factory were two more of his ventures. He worked as a bookkeeper in the Steinbach Hatchery as well. While living in the Grunthal/Gnadenfeld area, he managed the telephone exchange there and after 1938 he did the same in Kleefeld. Peter was also involved with the establishing of the Mennonite Heritage Village (museum) in Steinbach. In 1956, Peter A. and Lena Braun moved to the Fraser Valley, British Columbia, Canada. Peter and Lena Braun had ten children, all of whom survived childhood. Peter died on 14 August 1971 in Sinclair, Manitoba a few months after celebrating their 60th wedding anniversary, which they did early due to his failing health. Minnie "Lena" (Friesen) Braun died on 4 February 1991. Braun, Walter F. "Peter A. Braun 1890-1971." Preservings No. 13 (December 1998): 83-85. GRANDMA (The Genealogical Registry and Database of Mennonite Ancestry) Database, 5.03 ed. Fresno, CA: California Mennonite Historical Society, 2007: #128480. Huebert, Susan. "Braun, Peter A. (1890-1971)." Global Anabaptist Mennonite Encyclopedia Online. November 2007. Web. 22 Apr 2019. http://gameo.org/index.php?title=Braun,_Peter_A._(1890-1971)&oldid=163089. Huebert, Susan. (November 2007). Braun, Peter A. (1890-1971). Global Anabaptist Mennonite Encyclopedia Online. Retrieved 22 April 2019, from http://gameo.org/index.php?title=Braun,_Peter_A._(1890-1971)&oldid=163089.